Today was like a game of football... a game of two halves. In the morning we had glorious warm temperatures, but by early evening it was back to grey rainy weather. 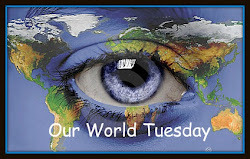 It was the kind of day that reminded me of my time when I lived abroad. Outside of the house would be warmer than the inside. Thankfully I captured images of the better half of the day. I had just taken my newly retired hubby back to school... cookery school that is. The cookery class was part of a birthday gift and thankfully he loved the idea. He even had ideas of grandeur.... commenting that he could be the next Paul Hollywood! All he hoped was that by the end of the day he didn't have a soggy bottom! After I finally got my laughing under control, I was ready to do the school run! 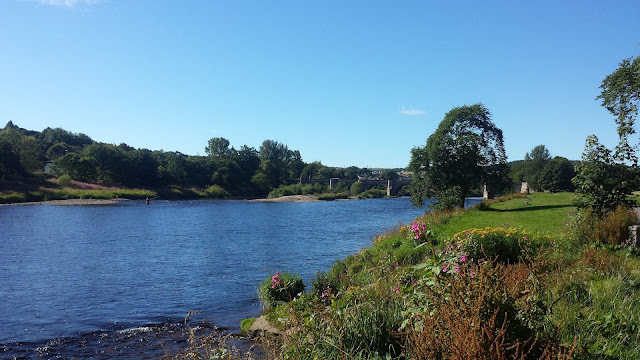 As I passed the River Dee I just had to stop the car in order to take a few photos. In the photo below you can see the Bridge of Dee which is one of the oldest bridges in Scotland. The Bridge of Dee or Brig o'Dee is a road bridge over the River Dee and dates back to 1527. If you look closely in the centre of the photo above, you can see a fly fisherman. He is casting his fly for salmon. 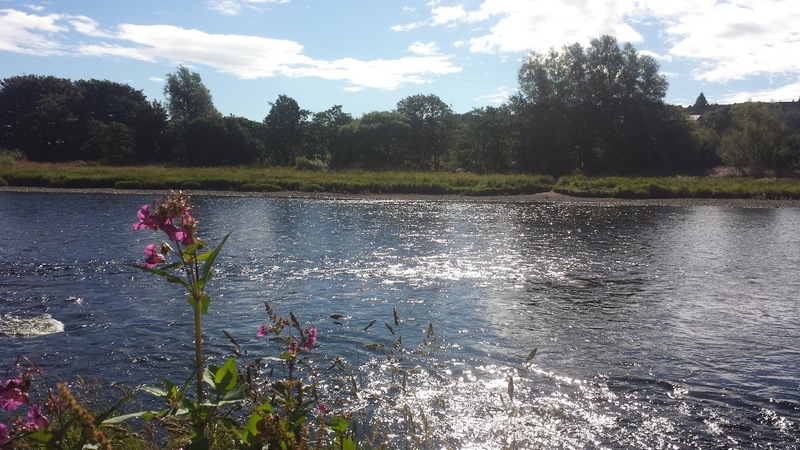 The River Dee is renowned as one of the great salmon rivers of the world. I can't help thinking that even though it was a beautiful warm morning... it would be pretty cold standing waist deep in the river. The pink flowers looked incredibly like orchids but I'm not sure. I'll have to go back and take some detailed shots of them. The cooking class was a huge success by the way. He even managed to save a sample of one of the dishes out of the three he'd made and brought it home for us to sample. He ate the other two, plus samples of the chef's work! I dread it now that he'll probably be so fired up... he'll no doubt start to preach about not using jar's for sauces anymore! I may have created something I may later live to regret! So that's it for today folks. I'm linking up with Photoalife once more. Just before I go I'd like to link up with Mersad over at Through my lens over in Bosnia and Herzegovina. He has lots of great photographers link up, so if you'd like to see more then please just click on the link above. Have a wonderful week and thanks for popping into my place. Love the first shot in particular - the way the sun glistens off the water. It was a fabulous day Louise. Don't you just love it when something strikes you and you just have to stop to capture it. I loved those pink flowers too and will have to find out what they were. 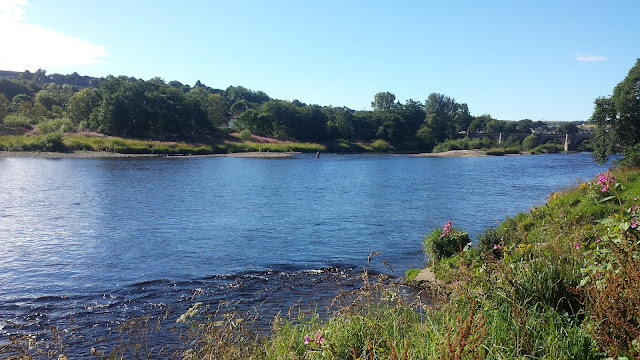 Beautiful pictures of the river Dee, the water looks so inviting and blue. We have salmon in our river too though I've only ever spotted them after a storm. Inviting perhaps Fiona, but there's no way I'd take the plunge thank you very much! It would have to be tropical temperatures for me I'm afraid. Further up the river there are salmon ladders where you can watch them leap up stream. It's fascinating to watch. Looks like you might need to book in your time in front of the Aga this winter? Always encourage all signs of male cooking I say! That leaves you more time to go … fly fishing!! He's cooking up a storm as I type Wren. I obviously haven't had a clue how to cook for over 40 years... so it's a good job he's now able to put me right! He's so keen and he's also very organised and tidy, so I think it's a win win for me as long as he doesn't over spice everything. Fly fishing... humm... I may have to rethink this option. I just couldn't resist John. The light and reflections just caught y attention as I was driving along the river. Thankfully there was a place to stop and park up. Me too Darren. It was the first bright sunny day for nearly a week, so I didn't want to miss capturing it. Haha... yes I'm happy to report no soggy bottoms here! Spicy maybe but not soggy! It was a little early for a Saturday morning so there wasn't many people about. It was very peaceful. There very often salmon fishermen wading in the river here and sometimes it's not particularly good weather! Thanks Jeno, that's just how I felt when I took the photo. What a beautiful day to capture photos, it looks gorgeous there. Not sure I'd fancy being waist deep in the water though, I'm sure it's pretty cold! It was the first sunny day after about a week of wet grey rainy days Lauren. I just couldn't resist capturing the beautiful sunlight and tranquil scene. Even so I still wouldn't want to have to stand in that river. It would have been very chilly indeed! I certainly hope that he was successful, but whilst I was there I didn't see him catch anything. It was great to watch him cast his line. You captured the sunshine glittering on the water in that first shot--wow! I had a few other shots too Rita. The light was incredible and after a very wet grey week... it was stunning. I'm thrilled I was able to capture it. Hubby is cooking up a storm (or curry) as I type. I'm thinking that this new hobby might actually work to my advantage after all. Gorgeous photos - the water does look cold but very clean! Do y'all fish - what could be better than fresh caught wild salmon - caught that morning and cooked that night - YUM! Firstly I need to apologise to you Sandy... I accidentally pressed delete instead of publish for your lovely comment. In my defence it was late at night and I was using my Kindle which means the buttons are minute! Enjoy all the delicious things your husband will no doubt soon be cooking and baking for you! I'll certainly try Debra... I just need him to calm his enthusiasm with the spices! If you have a scratch and sniff screen on your computer Jennifer, you'd smell the spicy aroma that is wafting out of the kitchen as I type. No jars are to been seen for this particular dish! Thanks Melody, whilst I was driving along following the river, I had to stop to capture the beautiful sunlight on the river. Thankfully there was somewhere to park up in order to do that. Yep hubby has cooked tonight so I was able to do some sketching. I think this new hobby might well work in my favour! Oh boy that is rather roasty toasty for me. I've lived in places with those sort of temperatures with high humidity, so know what you are having to deal with. I think those days are done for me. A nice mid range would do... not the 50 degree's we're currently having. It's hardly like summer! Thanks Margaret, I just had to park the car and capture the images. We had had such a grey wet week that is was such a delight to see the sun at last! Yes it is a beautiful river. It meanders through Royal Deeside from the Cairngorms down to the North Sea in Aberdeen. There are lots of beauty spots along the way. Oh, how lovely Deeside is. My grandmother, the Fraser one, was from that area many years ago. We almost made it there: mother, father, sister and her husband, brothers and their wives, and me, but the boys got sidetracked by That Golf Course as we headed north from Edinburgh. And Dad didn't get to fish in Scotland. But we loved what we saw, and the photo of the fisherman makes me think of Dad. I am returning soon, this time to see if I can make it up the west coast to the highlands where my MacKenzie grandparents came from. I wonder what will sidetrack me. I suspect Skye, and I'm sorry not to be going to Eriskay. Sigh. How interesting to read your lovely comment Kay. It is a beautiful part of the country with some amazing sights to see and photograph. Why am I not surprised to hear that the boys got distracted by the Golf Course... there are so many of them too. Due to the status of St Andrews as the 'home of golf', other courses followed suit and the 18 hole course became the standard which has remained to the present day. There are now more than 550 golf courses throughout the country, with at least 21 courses in Edinburgh alone! It's a shame your Dad didn't get to fish in Scotland. There are often men in waders fishing along the Dee. The west coast can be prone to midges, so I'd say come prepared. The landscape is breathtaking and Skye will definitely captivate you for sure. I've never been to Eriskay. Have a wonderful time when you come across and I hope the weather will be kind to you. Thank you so much Villrose, I appreciate it. What beautiful photographs. The water is so lovely. It sounds like your husband is enjoying his gift!